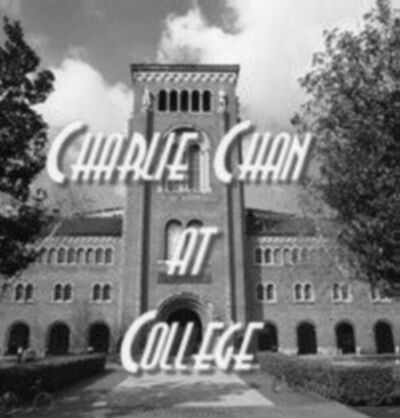 CHARLIE CHAN FAMILY SCRIPT PROJECT: "Charlie Chan at College"
What follows is a script for an "imaginary" Charlie Chan movie. 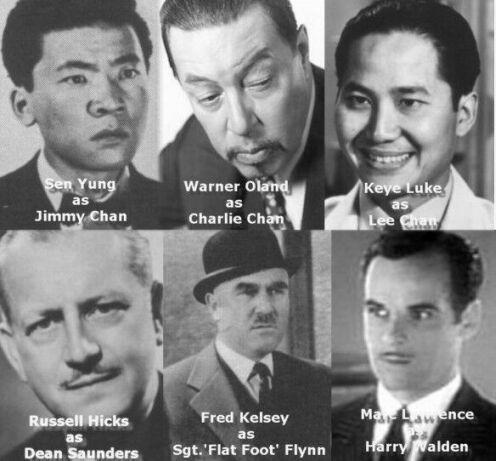 This was a group effort, from 2002, by Charlie Chan Family members to produce a full script, with illustrations, in the style of those that were used to produce the Charlie Chan films that were made decades ago. We hope that our honored visitors will find some small enjoyment in our humble efforts. And now, we hope that you will have fun as you read CHARLIE CHAN AT COLLEGE. Based on the character "Charlie Chan"
FAR SHOT of the University of Southern California. PAN to a street scene of a series of three story buildings--dormatories and fraternity houses. Dissolve to front door of one house, as two young men, Lee Chan and his younger brother Jimmy Chan follow their father, Charlie Chan. CHAN: Must congratulate number two son surviving first year at college. LEE: (Pointing across the street) There's the "Toy Store," Pop! JIMMY: I go there all the time! CLOSE SHOT of a sign encircled by a pair of comedic dragons that reads: "TOY STORE"
MEDIUM SHOT of the three. CHAN: (Stops abruptly causing Lee and Jimmy to almost run into his back) Toy Store? Has freshman son been wasting time away from important college studies in an establishment for children, and does "oldest" son now seek to displace his younger siblings in the sandbox back home in Honolulu? JIMMY: Pop, it's not what you think! It's a swell place where all the students go! LEE: It is kind of screwy. JIMMY: Yeah, strictly off the beam! CHAN: (Puzzled) "Strictly off BEAM?" Am afraid ancient ears of honorable father not tuned to radio frequency of modern sons. CLOSE SHOT of Chan and Lee. LEE: (Looking at Chan): It's owned by a Mr. Ling Toy, a nice old guy. I heard that it started out as a grocery store with a soda fountain in the back. MEDIUM SHOT of the three as Jimmy interjects. JIMMY: (Almost interrupting) Yeah, but they started selling more malteds and fewer groceries! Mr. Toy, the owner, was so busy at the soda fountain and the shelves have gotten bare enough that we started asking him to put out ketchup and mustard bottles with napkins and straws. LEE: (Grinning) I hear that Mr. Toy finally put some tables in one corner. JIMMY: (Grinning back - proudly) For the older students who are too wobbly to stand up like us big athletes! CHAN: (Shaking his head as he prepares to cross the street) Will take humble self to other side of street if only to clear head and gain respite from double dose of confusion. CLOSE SHOT of Chan as he looks both ways and steps into the street accompanied by his two sons close behind. FULL SHOT as, halfway across the street, a car roars around the corner and heads for Chan. Lee and Jimmy tackle him into a space between two cars on the far side. FULL SHOT as some Chinese girls come out of a nearby house. One of them runs to the Chans. CLOSE SHOT on Samantha "Sam" Wu. MEDIUM SHOT of another Chinese girl comes out of the Toy Store, wearing a silky not-quite traditional Chinese outfit with western style sleeves. She is wearing a white apron over it and a little white cap with ruffles in her hair. San Toy stops only for a second and runs to the Chans and Sam. FULL SHOT of group as Chan, Lee, and Jimmy dust themselves off and slowly get to their feet. SAN TOY: Jimmy! Are you okay--? LEE: (Shaken) That driver tried to run you over, Pop! Are you all right? JIMMY: Wow! That was sure a close shave! CHAN: Fortunately, elderly father still have plenty whiskers. Thank you both for timely shove off of bulls eye. JIMMY: You said it, Pop! I thought you were a goner, sure! CHAN: "Pop" not "going" anywhere yet, it seems. MEDIUM SHOT of Sam with Chan, Lee, and Jimmy as she helps Chan to his feet. SAM: (To San Toy) Hold on! Don't you think that we'd better--? CHAN: (Interrupting) Please - Best to leave street to automobiles. He turns to see an older man rushing from the same "grocery store" as the two girls. FULL SHOT as Ling Toy enters to the whole group. LING TOY: (Bowing as he reaches the Chans) Is everyone all right? May suggest the miserable shelter of my humble establishment as refuge from unexpected dangers of Los Angeles street for honorable gentleman, Charlie Chan, whose famous face has often graced our city's newspapers? SAN TOY: Charlie Chan?? That's your father, Jimmy? Jimmy smiles, silently acknowledging her question. CHAN: (Returning bow) Am warmed by both your kindness and your overly generous praise. Hospitable offering of comfort in time of great trial is like a spoonful of honey in a cup of bitter tea most welcomed by humble self and sons. Thank you so much. FULL SHOT as Ling Toy leads the group back to his store. Sam gets between Jimmy and his father to support Chan by the elbow, pushing San Toy out of the way. San Toy stands there momentarily, stomps her foot and grabs Charlie's other elbow, pushing Lee out of the way. CLOSE SHOT as Lee grins at his brother Jimmy who rolls his eyes. FADE OUT as they follow the others into the store. FADE IN as Chan, Lee, and Jimmy sit at a table as Ling Toy nudges his daughter. LING TOY: Daughter, please bring food and tea for our honored guests. SAN TOY: (With an unhappy glance at Sam) Yes, father. She exits, reluctantly leaving the field to Sam. CLOSE SHOT of Jimmy as he stands up and introduces the remaining girl. JIMMY: Pop, may I present Miss Samantha Wu? MEDIUM SHOT of Chan, Jimmy, and Sam. CHAN: (Rises from his chair, bows, and sits back down, patting his brow with a handkerchief) So pleased! JIMMY: And a good one, too! CHAN: (Eyeing his son) Please, take seats and join detective who finds it preferable to sit following close call with car outside. Charlie Chan and sons nearly paid unexpected visit to realm of honored ancestors! FULL SHOT as Sam, Lee and Jimmy sit down and San Toy brings a tray with cups and treats for all. She tries to push a chair between Sam and Jimmy but Lee pointedly makes more room for her on Jimmy's other side. MEDIUM SHOT on a third, older, girl who enters waving a pencil and notepad in hand. IRENE CHOW: Mr. Chan! Mr. Chan! I wrote down the number of the car that tried to hit you. Lee gets up, offering his chair to Irene. Smiling at him, she takes the seat. MEDIUM SHOT of Irene and Chan as Irene tears a page off of the pad and hands it to Chan. IRENE: A friend is calling the police. I not only wrote the number down but the description of the car. It had a coffee brown body with a dirty cream top. I think the driver had a tweed jacket and reddish blond hair. Oh, and he wore glasses with tinted lenses. I think he was of about medium height. FULL SHOT of the group. JIMMY: (Surprised) How could you tell? IRENE: (Turning to him, just as surprised) I don't know, but he was sitting tall enough to see over the dashboard but short enough that you could see the top of his head framed in the car window. LEE: (Trying hard not to laugh at his brother) Are you going out for the police department, Miss . . . ? Irene: (Her eyes open wide) Oh! No! FULL SHOT of group as Irene swings around to face Chan. IRENE: (To Chan) My name is Irene Chow, Mr. Chan. My father owns and runs a newspaper in Chinatown in San Francisco and . . . well . . . Well, Mr. Chan, he wants me to be a secretary, but I want to be a reporter and work my way up like he did so I can help him run his paper! MEDIUM CLOSE SHOT on Chan and Irene. CHAN: (Giving Irene a fatherly smile) A devoted child is a father's greatest gift. Great struggle for honorable child . . . to make parent happy or to ease his burden. IRENE: But, you see, Mr. Chan, I know that car! This isn't the first time I've seen it! There's a gang here and the man that runs it . . . . That's his car. FULL SHOT of the group at table. CHAN: (Showing concern) You are sure of this? IRENE: Sure? You bet! Dad thought he'd be nice and decided to "let" me cover a story and sent me here to cover the big art exhibit. Dad doesn't know it, but in my spare time I go over and try to pick up nice juicy stories. I pester our local officer on the beat, Sgt. Flynn, so often that he threatens to have the cops at the station adopt me as their unofficial mascot I'm underfoot so often. IRENE: And don't you forget it! LEE: I'm here for the art exhibit, too. IRENE: Yes, I know! In fact you are the reason that my father sent me to Los Angeles to cover the art show here. It isn't every day that the son of a famous Chinese detective is involved in a big art show after winning an award in Paris! MEDIUM SHOT on Chan, Lee, and Irene. CHAN: Excuse, please but what is "Flat-foot" Flynn? The other girls and Jimmy start laughing. MEDIUM SHOT of Jimmy, San Toy, and Sam. CHAN: Ah -- such disrespect from the mouths of today's youth. MEDIUM SHOT of Jimmy and Chan. JIMMY: Sorry, Pop. But you'll see what we mean when you meet him yourself! Chan just shakes his head slowly. IRENE: (Interrupting) But, Mr. Chan! I've seen the head of this gang driving around the campus here in that car. A couple of times he's pulled over and made cracks about how a mouse could get caught by a cat if it squeaks too often. CHAN: Perhaps streets are not safe for young moth who wishes to fly too close to dangerous flame. IRENE: You're not turning into an old fuddy-duddy, are you, Mr. Chan? CHAN: No, merely make humble suggestion that for time being, you must be very careful. Is there someone you trust to accompany you on unexpectedly wicked streets? MEDIUM SHOT as Irene looks thoughtfully at Charlie for a moment and then turns to Lee and blushes deeply. CHAN: (Shaking his head and smiling) Only alternative is acting as secretary to elderly Chinese detective while he is here to speak with head of University for series of guest lectures. LEE: She could kill two birds with one stone. Or . . . job . . . well, you know what I mean, Pop! CHAN: This afternoon is no time for talk of birds and stones. We go now to see honorable President of University, Mr. Winton! Sally Winton sits on the edge of the desk of her father, university president Coleman Winton, in his office. She is fidgeting with the band around her hat. The two have been discussing Sally's love life and she is dejected, unable to convince Winton that Tom is worthy of her. Winton is at his bookcase replacing a copy of Shakespeare's "Titus Andronicus." He has the volumes shelved alphabetically yet can't seem to locate the exact spot for his novel. Giving up, he tosses the book back on the desk knowing that his secretary will file it away tomorrow. He turns around to his daughter. MEDIUM CLOSE SHOT of Sally and Winton. WINTON: Sally, you may as well give up, I simply don't like Tom. SALLY: But father, after all you hardly know him. WINTON: I know him well enough to dislike him. Sally, I'm asking you not only as your father, but as someone who loves and cares deeply about you, give Brandon Mitchell consideration. He's smitten with you, always has been and will make a fine naval officer someday. SALLY: He left to join the Navy without even talking to me about it first. It was almost as if he wanted to get away from me. WINTON: Now you know that isn't true. Brandon has the same streak of independence that I've witnessed in you; and on more than one occasion I might add. I admire him, daughter, and you need to realize that you will never be able to change him. Have you told Tom about Brandon? MEDIUM CLOSE SHOT as he gazes intently at Sally who is unable to hide her love for Brandon. WINTON: Ah hah! No you haven't. And I'll wager you never will. MEDIUM SHOT of both as Sally attempts to look away. Winton reaches out and pats his daughter lovingly on the shoulder. He dotes on his only child and when he gazes into Sally's eyes, he sees his late wife, Meredith. Sally has never been able to tell her father a falsehood and reacts as only she can with the truth. SALLY: You're right, I haven't told Brandon about Tom. I'm afraid of what he might think. MEDIUM CLOSE SHOT as Winton sits beside Sally on the desk determined to give her some fatherly advice. WINTON: You're my best girl. And for ten long years, nearly half of your young life, it's been just the two of us. My dear, I'd be worse than a scoundrel if I held onto you any longer without giving you a chance for happiness the kind your mother and I shared. Sally, Tom Mallory isn't the man for you. Brandon is. Give him a chance to explain his actions. FULL SHOT of both as she puts her head in her hands and begins to softly cry. The intercom speaker blares and the secretary announces the arrival of Charlie Chan and company. SECRETARY: Mr. Chan is here to see you, Mr. Winton. WINTON: (Flicking a switch in the speaker) Please send him in, Miss Danley. WINTON: Here, you blow your nose like the trooper I know you are and let's greet our Mr. Chan. SALLY: You know the trouble with you is that you know me better than I know myself. FULL SHOT of both as she smiles weakly at her father's gesture of a handkerchief and then snatching it playfully from his hand, she blows her nose. Chan and company enter the office. WINTON: (Moving to Chan and shaking his hand) Well, Charlie, you took your time getting here! Welcome, welcome! CHAN: (Bowing) Thank you so much. Very sorry. Immutible fates dictated slight detour on path to your office. Please to meet sons number one and two, Lee, here for big art exhition and Jimmy, currently attempting to honor Chan family with exemplary performance at your university. LEE: And don't forget, we have an ace reporter in our midst! (Gesturing toward Irene) Irene Chow from San Francisco. WINTON: Well, well. Please allow me to well come all of you. Sally recognizes Irene as someone she has seen around campus. Sally acknowledges Irene with wink. Irene winks back. MEDIUM SHOT of Chan, Sally, and Winton. SALLY: Mr. Chan on behalf of father and I, may I extend our sincerest welcome. Our university is honored to have you presiding over the Forsythe lectures this spring. May I say how excited we are and what a coup it is to have someone of your caliber lecture on criminology. CHAN: Flattery falls on ancient ears like feathered caress of summer breeze. Am most honored to speak about life's ambition. Unfortunately, cannot stay just now. Must find lodgings for humble self and offspring, and must arrange for retrieval of ample belongings from baggage area of Union train station. INSERT of a sheet of paper reading "2039 Pinehurst Road." We will also arrange to have your baggage picked up and delivered to the house. CHAN: Thank you. Have given rest to troubled mind. Am now free to edit lecture notes instead of imposing upon local real estate agents. (Bowing slightly) Thank you so much. WINTON: Again, please accept my apologies for my absent minded behavior. The Forsythe lecturer always receives adequate accommodations for the duration of his stay. SALLY: If you're free later Mr. Chan, I'd be happy to take you out to the property and show you around. CHAN: (Bows, breaking into a wide-mouth grin) Will welcome company of most beautiful daughter of honorable President Winton. WINTON: I'm a plain-spoken man Charlie, and if there is honor around here, then I've cornered the market having someone such as yourself lecture here at our institution. You've no idea what it means to this college. Well, enough of this blather. Daughter, let's say we treat Mr. Chan and his entourage to a nice lunch at the Brown Derby. Who knows, we might even run into Clark Gable! SALLY: Oh, Dad you're incorrigible. FULL SHOT as Irene breaks into mouth wide grin. Everyone makes a show of grabbing hats and coats. Chan bows and Winton slaps him on the back. MEDIUM SHOT of Chan, Lee, Jimmy, and Irene. CHAN: (Opening his pocket book and removing twenty dollars and handing it to Lee) Suggest that you go with younger brother and young lady. It is beautiful day outside. Will meet you later here, following lunch before we occupy graciously offered home. LEE: (Somewhat disappointed) But, Pop! JIMMY: (Quickly - grabbing the money from Lee's hand) Okay, Pop! THANK YOU SO MUCH! CHAN: (Eying Jimmy with a feigned look of displeasure) A-HEM! FULL SHOT of a campus scene moving to a MEDIUM SHOT of Jimmy, Lee, and Sam who are visiting over soft drinks and peanuts under a palm tree on campus. Jimmy is leaning up against the tree shelling peanuts and popping them into his mouth. LEE: Jimmy, after all of the excitement this morning with that car that almost hit Pop and us I nearly forgot! A telegram was to come in care of you for Pop today, did you remember to get it? WHERE CAN I REACH YOU. Just something about Ben Covert arriving in Los Angeles tomorrow. Why, I'll bet Pop probably knew about it before he left for California. JIMMY: Ah...you know how Pop and his kind are, always calling or sending telegrams. Gee, I just want to know where we're staying while Pop is in town. Anything would beat the dorm and my roommate. SAM: Who is Ben Covert? JIMMY: A friend of Pop's. He works for the British government. CLOSE SHOT of Lee and Sam as Lee pops a few peanuts into his mouth and Sam takes a sip of her soda. CLOSE-UP of Jimmy who looks frustrated. MEDIUM SHOT of all three. LEE: (Noting Jimmy's sudden melancholy) What's wrong Jimmy? JIMMY: My roommate. I can't stand the thought of going back to the dorm. SAM: Who's your roommate Jimmy? JIMMY: Norman Cavendish the Third! All he ever does is listen to Mozart. It's enough to drive ya nuts. SAM: I have a musical appreciation class with Norman. He's strange, all right. You know, when that crazy driver nearly hit your Pop this morning, my first thought was that he kind of reminded me of Norman. Funny isn't it? MEDIUM SHOT of all three as Lee and Sam laugh. JIMMY: Mozart's music is okay if you like pre-historic stuff written by guys who wore powdered wigs and painted their faces. I might be able to stand Norman if he listened to something a little more hep. Why, this is 1938! FULL SHOT of all three as Lee jumps up off the grass and dusts his hands off on the back of his trousers. Sam takes notice of how tall Lee appears and Jimmy watches, green with envy. Lee is oblivious to them. LEE: (Trying to sound important) I need to get over to the Beverly Hilton. The art exposition people want to talk to me about a private showing next fall in New York. JIMMY: (Amazed) Wow, Lee, that's swell! LEE: (Still with an air of importance) Look, don't say anything to Pop just yet. I don't want him to get all excited and then have things fall through for me at the last minute. The disappointment may be too much for him to take. JIMMY: You can count on us, Lee. What do you want me to tell Pop when I see him? LEE: (Smiling) Oh, you'll think of something. But I won't be gone too long. See ya. CAMERA PANS with Lee as he saunters off. CLOSE-UP of Sam as she gazes at his fleeting form wistfully and sighs. MEDIUM SHOT of Jimmy and Sam as Jimmy takes notice again and gives in to his jealousy. JIMMY: (Suddenly looking serious) Sam, can you keep a secret? She nods. Her eyes become wide with interest. JIMMY: (Obviously attempting to out-do his big brother Lee) I'm working on something secret that is sure to have ramifications with our military. I even have a contact down in San Diego, Brandon Mitchell. But that's beside the point. What I need right now is an assistant. SAM: (Showing a measure of surprise) Brandon Mitchell. Didn't he date Sally Winton at one time? JIMMY: Who knows? He's originally from Texas but has been around here on campus for awhile. He got into the Navy just a few months ago. Sam makes a show of becoming serious and shakes Jimmy's hand. Her touch sends tingles up and down his spine. CLOSE SHOT on Sam as she joins in on Jimmy's "moment in the sun." SAM: (With an exaggerated serious tone) Mr. Chan, meet your new assistant. Now - what are we working on? JIMMY: (Hoping to impress Sam) I can't say anything just yet, but it's a special fuel additive for naval warships. See, I think that naval war power is the wave of the future. Just like Themistocles said, "He who has command of the sea has command of everything." SAM: That's swell, Jimmy! (With some skepticism) But, how did you come up with such an idea? JIMMY: Oh, I've been working on it after hours in the chemistry lab of my criminology class. At first I added some of the stuff, I mean the formula to the gas in a car I borrowed from a friend. It gave the car extra pep and drove like a red hot Indianapolis racer! CLOSE-UP on Sam who seems to be taking Jimmy a little more seriously now. MEDIUM CLOSE SHOT of the two as Jimmy continues. JIMMY: Then...I know this sounds crazy...I had the idea to try it out in the fuel that's used in battle ships. We just have to convince the Navy to test it! CLOSE-UP of Sam as she get dreamy eyed over Jimmy and his ambitions. SAM: Gosh Jimmy, you sure are swell...I mean, your idea! FADE IN to a FULL SHOT inside Tom Mallory's apartment. He is there with Harry Walden and Leyland Saunders. The three are sitting in Mallory's den drinking bourbon and discussing the arrival of Charlie Chan. Walden is particularly interested in his role at the Pinehurst Road residence. MALLORY: I had Sally give old man Jaramillo a vacation to Mexico for two weeks. I'll just tell her he came back early. She'll never know the difference. SAUNDERS: Fine - but I'm still worried. We got Covert coming in tomorrow to meet with Chan. Between the two, they might get whiff of what we're doing with that foreign oil experiment. MALLORY: (With obvious impatience) You're talking about that crazy kid Jimmy Chan and his naval gas gimmick. He's been shooting his mouth off about it around that college, but that's all it is...TALK. Nothing will ever come of it. We need to concentrate on that re-fueling depot off San Diego Harbor. WALDEN: (Becoming annoyed with Mallory) Mallory, don't go getting funny on me. That young idiot Jimmy Chan might actually be onto something this time. In fact, I believe our contact in Europe would interested in buying his stuff. Look, two Ben Franklins oughta be floating in your eyes about now. If the kid's on the up-and-up, and we get the goods to that formula, and like they say, the world is our oyster. SAUNDERS: Walden, you're not telling me anything that I'm not already aware of. The only thing standing in the way of our operation is Charlie Chan and his good friend Ben Covert. WALDEN: (Impatient) Yeah I hear ya - like a sour note I hear ya. But I got plans, see. Big plans. Chan and his buddy ain't gonna be in the way for long. CLOSE-UP of Mallory as he suffers a coughing spasm. MEDIUM SHOT of the others as they stare at him quizzically. SAUNDERS: (Opening a humidor on his desk and removing a cigar) Here my boy, have a fine cigar then instead of that cigarette. WALDEN: Saunders...got any of those Cuban specials ya keep for occasions? SAUNDERS: Of course my good man, of course. Saunders take out a little device that looks like a small guillotine which he uses to quickly and deftly cut the end off of the cigar. WALDEN: Watch your fingers, there, boss! Someone could get hurt with that thing! Saunders chuckles as he lights the Cuban cigar that Walden sticks in his mouth. The gangster inhales a large drag and soon, cigar smoke fills the room. Saunders and Walden toast each other with their bourbon glasses but Tom keeps to himself allowing his cigar to hang from his fingers not trusting his lungs to handle the smoke. MEDIUM SHOT of the three as Mallory refreshes Walden's glass. Saunders eyes Mallory, wondering what is wrong with the boy. FULL SHOT of the room as Mallory walks over to the window and stares out. MALLORY: (Muttering to himself) Was that doc right about my pipes? FADE IN to a FULL SHOT of the exterior of the Brown Derby restaurant, cars passing, patrons going in and out. FREDERICK: Have you reservation..? (Suddenly recognizing Winton and his daughter) Oh, President Winton and Sally what a pleasure to greet you! How many will be in your party this afternoon? WINTON: Three, Frederick. We have an honored guest with us. None other than the famous Charlie Chan who will grace our institution as guest a lecturer. FREDERICK: (Turning and bowing to Chan) On behalf of myself and the Brown Derby I greet you. CHAN: (Bowing in return) Most humbly accept greeting so fondly expressed. Simple detective feel most tiny in such elegant surroundings. FREDERICK: Won't you come this way, please...? MEDIUM TRACKING SHOT as the four proceed through the crowded restaurant and are attentively seated. MEDIUM CLOSE SHOT of the group, Winton, Sally, and Chan seated as Frederick passes out the menus, bows slightly, and departs. CLOSE SHOT of Chan as he thoughtfully scans the menu in his hands. CHAN: Most excellent variety of dishes. SALLY: (Trying to act "at home" in the rather plush setting) Certainly, Mr. Chan. MEDIUM SHOT of Chan and Sally. CHAN: Please to call me Charlie. SALLY: (Smiling) Why, of course. Well, you see...Charlie, the Derby is renowned for its variety and quality. CHAN: (Frowning a bit) But not for its economy! WINTON: Don't let the prices put you off your appetite Charlie! CLOSE-UP on a smiling Chan. CHAN: Yet, frugality is mother of prosperity. CLOSE SHOT of Chan and Winton. ...which will cover the cost nicely. CHAN: Yet, must be very fine beefsteak to cost two-and-a-half dollars! MEDIUM CLOSE SHOT of all three. SALLY: Well, Charlie I did say fine food, but not cheap food. CLOSE SHOT of Chan and Sally. CHAN: (Smiling) Fond greeting of head-waiter indicate frequent use of wonderful mainland invention. WINTON: Part of my job description, I'm afraid, Charlie. CHAN: Understand. Will drink from spring and be grateful for its source. FULL SHOT of Winton, Sally, and Chan eating their meal. Well dressed patrons are coming and going past the dining area. MEDIUM CLOSE SHOT of the three. SALLY: As you can see Charlie, the Derby never lacks for celebrities. WINTON: It is the place to see and be seen especially by the film colony. CLOSE-UP of Chan as he studies the passersby. CHAN: Did think I recognized faces familiar through innocent enjoyment of silver screen. SALLY: (Sighing) But, no Clark Gable, today, I'm afraid. WINTON: (Patting Sally's hand) Don't let the disappointment spoil your afternoon my dear. You see, Charlie, Sally is quite taken by a certain few film idols. CLOSE-UP of an embarrassed Sally. CHAN: Own number one daughter, Ling, had similar infatuations with several gentlemen of silver screen before meeting honorable husband. SALLY: Then you know, Charlie, that a girl can dream. CHAN: Yes, until the dream becomes an even sweeter reality. SALLY: (Glancing at her father and then back to Chan) Well, Charlie, when my Prince Charming brings me to the alter, I expect to see you sitting in the front row! CHAN: (Nodding with a broad smile) Shall be most honored. MEDIUM SHOT of the three as Winton pats his mouth with his napkin and gets up from his chair. WINTON: Why yes... I say Warner, hello. Could I impose on you for a moment? MEDIUM SHOT of a well dressed gentleman with vaguely Oriental features who stops and turns in their direction. He smiles as he recognizes President Winton and comes to acknowledge Winton's request. 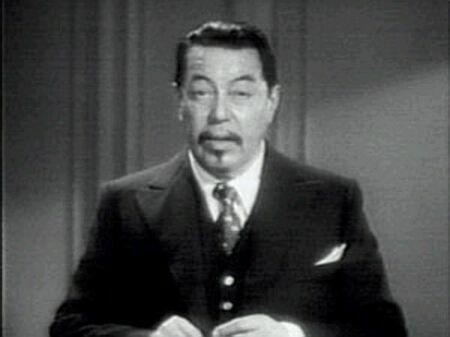 CLOSE SHOT of Warner Oland as he speaks to Winton. Although his hair is slightly longer than usual in preparation for an upcoming movie role, he still bears a "striking" resemblance to Charlie Chan. OLAND: Why of course, President Winton. What a pleasure to see you again. Sally, as well. My pleasure is more than doubled. CUT TO CLOSE-UP of Chan, smiling. CUT TO CLOSE-UP of Oland smiling. MEDIUM CLOSE SHOT of Sally, now standing, Oland, and Winton. SALLY: (Smiling, after doing something of a "double take" at the facial similarities of Oland and Chan) Flatterer. Oh, Dad, these film idols? OLAND: (Chuckling) Well, Sally, I must uphold the screen actors' code. FULL SHOT of all four standing around the table. WINTON: (Gesturing toward Chan) I wonder if I might introduce you to someone, Warner. WINTON: Warner, this is Mr. Charlie Chan who will be giving a series of lectures at our college. MEDIUM SHOT of Chan and the back of Oland (a stand-in) as Chan rises diffidently shakes Oland's hand. CHAN: Most honored to meet actor of great renown. MEDIUM CLOSE SHOT of Oland and the back of Chan (a stand-in) as the pair finish their handshake. OLAND: Are you the great Honolulu detective? The Charlie Chan? It is I who am honored, indeed. CHAN: (Bowing slightly) Must plead guilty of being same. OLAND: Why, Mr. Chan who hasn't read and been thrilled by your exploits? CLOSE SHOT of Chan, who holds up his hand in a gesture of "stop, please." CHAN: Please, no more, or poor detective's hat will soon be too small for head. Like image so small on film but blown up greatly when projected on screen, so humble detective's efforts greatly exaggerated by journalists eager for sensation. MEDIUM SHOT on Oland and Winton, both looking at Chan. OLAND: Your modesty does you all the more justice. FULL SHOT of the group (Oland's stand-in with back to camera) as they are interrupted by the Frederick who comes to the table followed by a tall, sturdily built man in a dark somewhat rumpled suit. FREDERICK: Excuse me for interrupting, but this gentleman, that is, Captain Dormers, expressed an urgent need to speak with you, Mr. Chan. Dormers steps in front of Frederick rather abruptly. DORMERS: (Rather gruffly) Okay, I can handle my own introduction. OLAND: Just a moment... I believe you have the wrong suspect. My name is Warner Oland. I'm only a screen actor. May I introduce the man you are looking for (Indicating Chan). MEDIUM SHOT of entire group (Oland stand-in with back to camera) as Chan who bows slightly towards Dormer). OLAND: Well, gentlemen...(Glancing toward Sally) ...and lady...I have an appointment to keep. So, I offer a fond good-bye. It was indeed a pleasure, Mr. Chan. CHAN: (Bowing) Honor completely mine. Multitudinous family in Honolulu will certainly pester humble parent over our meeting. Suspect that we may share distant kinship. FULL SHOT of the remaining four. DORMERS: (A bit embarrassed) By golly Mr. Chan I should have recognized you right off the bat. Sometimes I speak before I think. CHAN: Often dangerous habit for detective. DORMER: You're telling me! But say, I'd better get down to business. I traced you here through President Winton's secretary. I'm afraid I have some tough news for you. CLOSE-UP of Chan showing sudden concern. CHAN: What is nature of news, please. MEDIUM SHOT of Chan and Dormers. DORMERS: A man was just knocked down by an hit and run driver over near the college campus. He was pretty banged up and is still unconscious. Anyhow, his papers included an English passport in the name of Covert. DORMERS: (Surprised) Yeah! That's right! MEDIUM-CLOSE SHOT of Chan and Dormers. 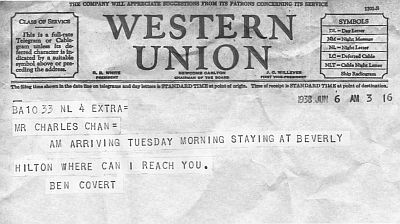 CHAN: (Quickly inspecting the letter) Most assuredly my letter to unfortunate friend, Ben Covert. DORMERS: Would you come with me to the hospital for a more positive identification? CHAN: When friend is in distress friend must answer call. (Turning to Sally and Winton) Must apologize for sudden departure. Thank you for splendid meal in most wonderful restaurant. MEDIUM SHOT of the group. WINTON: Absolutely. I only hope that your friend is not badly injured and will recover soon. MEDIUM SHOT - INTERIOR OF "TOY STORE." Jimmy is seated at the malt shop's counter conversing with San Toy. JIMMY: So I figure that with a little more work my fuel energy enhancer will be a pretty valuable item. SAN TOY: (Smiling and "making eyes") Gosh Jimmy, that sounds wonderful! CLOSE SHOT of Ling Toy at the far end of the counter. LING TOY: (Breaking San Toy's mood) Aha, then maybe you can pay for all the malts purchased on the credit of honorable Chan name. MEDIUM SHOT of all three as Jimmy and San Toy move over to Ling Toy and sit down. JIMMY: (Embarrassed and flustered) Gee! SAN TOY: Oh, father. I trust Jimmy! MEDIUM SHOT of the Toy Store front door as a clearly excited Irene Chow makes an hurried entrance. MEDIUM CLOSE SHOT of Irene. IRENE: Jimmy! San! It's happened again, but this time worse! CLOSE SHOT of a surprised Jimmy and San Toy. JIMMY: What do you mean Irene? What's happened? IRENE: Another hit and run accident. MEDIUM SHOT of all four. IRENE: No, no, not Mr. Chan. Someone else. An Englishman named Covert. IRENE: Gee, Jimmy, does your Pop know about this? JIMMY: No, I forgot to give it to him. This is serious. Was, was he killed? IRENE: No, not dead, but he's in bad shape and he's still unconscious. JIMMY: Do you know where they took him? CLOSE SHOT of Jimmy, Irene, and San Toy. IRENE: Why, University Hospital, I believe. FULL SHOT of all four as Jimmy gets up to head toward the door. SAN TOY: Say Jimmy where you headed? CLOSE SHOT of Jimmy at the Toy Store door. JIMMY: I'm going to the hospital to check this out. Mr. Toy, if Pop or Lee call, please tell them what happened. CLOSE SHOT of Ling Toy. FULL SHOT of the Toy Store interior. IRENE: (Dashing for the door) Wait for me, Jimmy! ESTABLISHING SHOT of the imposing exterior of a hospital. CLOSE SHOT of a sign that reads "UNIVERSITY HOSPITAL." EXTERIOR SHOT of University Hospital as a police car rolls up at the main entrance. MEDIUM SHOT as Chan and Captain Dormers get out of the car. DORMERS: (Turning back and saying to the driver) Okay, Helman. You stick here and keep your eyes open. I don't think we'll be long. HELMAN: Right you are, Captain!MEDIUM SHOT of Charlie and Dormers entering the hospital. MEDIUM SHOT as they approach the main desk. Dormers shows his badge and is directed on. MEDIUM CLOSE TRACKING SHOT from the front as Chan and Dormers down a hall. CHAN: Police have description of car that hit unfortunate friend? DORMERS: Yes. We got a partial description from a witness, and, get this, Charlie, it was a black sedan, different from the one that we had received a report of almost running you down this morning. With all this, I had almost forgotten about your close call! The boys are running a check on the license number right now. CHAN: Puzzling develpment. Point to picture of increasing size. MEDIUM SHOT as they proceed down the hall to a bank of elevators. In doing this they pass a young man standing against a wall apparently engrossed in his newspaper. As they proceed past and down the hall he lowers the paper and stares intently after them as they enter an elevator. The man moves quickly to a nearby phone booth. MEDIUM SHOT as the Caller exits the telephone booth. Just as he steps, out Jimmy Chan, careering down the hall closely followed by Irene, runs into him. The young man and Jimmy go sprawling and Irene by some fancy high stepping avoids the same fate. CLOSE-UP of Jimmy sitting on the floor looking bewildered then suddenly gives a smile of recognition. JIMMY: Hey Norman - it's you! MEDIUM SHOT of Jimmy, Irene, and Norman. NORMAN: Jimmy, fancy running into you like this. Or did you run into me? IRENE: (Looking puzzled) What are you doing here Mr. Cavendish the third? NORMAN: I was planning to attend the noon string concert up in the Solarium. Are you two going to attend? JIMMY: (Brushing himself off) No, I prefer a swing quartet and besides, I - I mean we have someone to see. NORMAN: Oh really...and who might that be? IRENE: Go ahead and tell him, Jimmy. NORMAN: (In a sarcastic tone) Yes...do tell me Jimmy! FAR SHOT of Samantha Wu coming around the corner and walking down the hallway toward them. She is wearing her student nurses' uniform. ...I was planning to meet Sam. And here she is now. MEDIUM SHOT of all four as "Sam" Wu enters the scene. JIMMY: Hi, Sam! Hope I didn't keep you waiting? (He grabs a surprised Samantha's arm and begins to stroll off with her) So long Norman, enjoy your concert! MEDIUM SHOT as Jimmy and Sam round the corner in the hallway where Jimmy pulls her into an alcove. CLOSE SHOT of Jimmy and Sam. SAM: What's this all about Jimmy? We didn't have any appointment! Besides, I'm on duty and if the head nurse finds us I'll be in hot water. JIMMY: I know, Sam, but I had to get away from that roommate of mine. MEDIUM SHOT as Irene joins Jimmy and Sam. IRENE: Did you tell Sam what happened? SAM: I think I have an explanation coming! FULL SHOT of Chan and Dormers standing at a hospital nursing station. Captain Dormers is speaking to the nurse in charge. MEDIUM SHOT of Dormers, Chan, and the Nurse. DORMERS: (Showing his badge) Nurse, I'm Captain Dormers of the Los Angeles Police. I've come to see Mr. Covert and have brought Mr. Chan here of the Honolulu Police (Motioning towards Chan) who is a friend of Covert's and who can provide positive identification. Is Covert still unconscious? NURSE: I'm afraid so...and he shows no sign of coming to. Positive identification would be helpful. Come this way, gentlemen. FULL TRACKING SHOT as they follow her to Covert's room nearby and enter. FULL SHOT from the far side of Covert's bed across the bed to the door which is just admitting the nurse followed by Dormers and Chan. Chan moves solemnly towards the bed. He stops and looks down. DORMERS: (Coming up beside Chan) Well, Charlie, what about it? CLOSE SHOT of Chan and Dormers. CHAN: Unfortunately, must confirm identity of good friend Ben Covert. Did he carry papers with him? DORMERS: Only his passport and a bill fold containing about a hundred dollars or so. Why do you ask Charlie? MEDIUM CLOSE SHOT of Chan and Dormers. CHAN: Have reason to suspect my friend was here on international investigation for British government. FULL SHOT of room toward door where the Nurse is standing. As Dormer finishes talking, the door opens slowly. CLOSE SHOT of Jimmy as he sticks his head into the partially open door. JIMMY: (In a hushed voice) Hi, Pop! CAMERA PULLS BACK as Jimmy, dressed in an orderly's uniform and carrying a stack of linens, edges into the room. Suddenly, he sees the Nurse by the door, and he is surprised to see Dormers who was hidden from his view behind Chan. JIMMY: Pop! Am I glad to see you! MEDIUM-CLOSE SHOT of the Nurse. NURSE: Just a moment. I didn't call for an orderly. How long have you been working at this hospital? CHAN: Excuse, please. Can solve this mystery. May introduce number two chip off old family block: son Jimmy. Can explain sudden change of occupation? JIMMY: It was the only way I could get to see Mr. Covert. You see I heard about the accident and I knew Mr. Covert wanted to see you. CHAN: One moment please. How you come to know unfortunate Mr. Covert wanted to see me? MEDIUM SHOT of Chan, Jimmy, and Dormers. CHAN: Most unfortunate, like rain after forest burn down, come too late. JIMMY: (Shamefaced) That's just it Pop - it didn't come too late. The message arrived this morning and I - I forgot to give it to you. CLOSE-UP on a grim-faced Chan. CHAN: Most unfortunate. Prior knowledge may have prevented unfortunate accident. If it was accident! But this we can not know for certain. Shame greatest punishment for innocent mistake. Admission of same shows strong character. Do not blame yourself further. What is done is done. We must now find out who did this and why. For this, most assuredly, was no accident. MEDIUM CLOSE SHOT of the door to the hospital room as Sam and Irene suddenly enter. Both are out of breath. IRENE: (Gently rubbing the back of her head) Jimmy! Norman has disappeared! Someone hit me from behind, and then he was gone! SAM: When I went back to find Irene after talking with you, I found her getting up off the floor. IRENE: He was acting like a big shot, trying to impress me. Of course, I wasn't going for any of it, and, just as I was about to turn and leave, I was hit by someone who must have come from around the corner in the hall. FULL SHOT of everyone in the room. SAM: On our way here we stopped at the nurses' desk and asked if anyone had heard of the music performance in the hospital's Solarium that Norman had mentioned to us. Nothing! It was a lie. (Looking at Chan) He's up to something, Mr. Chan! CHAN: That could be so. Behavior of suspicious student certainly suggests hidden motive for visit to hospital. JIMMY: Gosh, Pop! Should we go look for him? CHAN: All birds eventually return to nests, unless traveling south for sunnier climes - or caged. Suspect that case of young Mr. Norman may be likewise. Either he will be seen soon, or he has departed for more distant location, or... But, time will tell. JIMMY: But he slugged Irene! CHAN: Correction, please. Irene - slugged - by unknown party. Perhaps Norman himself not suspect sudden attack. (To Irene) You notice anything unusual about the demeanor of the young man just before unfortunate attack? IRENE: (Still touching the back of her head) Now that you ask, I can remember that the expression on his face didnt look any different than usual. But I'm not really sure, sir. CHAN: (In a fatherly way, to Irene and then to the Nurse) Perhaps kind nurse will assist young lady in distress? MEDIUM SHOT of Sam as she turns and exits right behind the Nurse and Irene. MEDIUM SHOT of Chan, Dormers, and Jimmy. JIMMY: (Interrupting) Cavendish...the THIRD... My roommate. DORMERS: Norman Cavendish. Roommate, you say!? Hey...just what do YOU know about this bird? JIMMY: (Realizing that he may be under suspicion himself, now) Nothing much, sir. I've never liked him. He's something of a loner. I don't bother him, he doesn't bother me. But, now that all of this has happened, I - I don't really know what to think. CHAN: (To Dormers) Can assure you that number two son is quite innocent of any wrongdoing. Still has much to learn of disappointments and dangers of the world. JIMMY: (Embarrassed) Gee, Pop! I'm almost finished with my freshman year! DORMERS: That's okay, kid. But, I suggest you stick around your dad while he's in town. MEDIUM CLOSE SHOT of Jimmy and a proudly smiling Chan. JIMMY: (Smiling) That's a bet! Chan puts his hand on Jimmy's shoulder - both smiling as we FADE OUT. FADE IN on Chan, Dormers, and Jimmy walking down a hallway near Covert's hospital room. A Second Nurse runs frantically to the group and into scene. SECOND NURSE: (To Dormers) Officer! Please! Something terrible has just happened! Please, come and help!! DORMERS: Okay...calm down, Miss...where's the problem? DORMERS: (Now realizing the true depth of the situation) Which way, lady?? SECOND NURSE: (Pointing down the hall) This way...PLEASE hurry!! The entire group leaves the scene quickly in the direction indicated by the Second Nurse, camera panning with them as we FADE OUT. FADE IN on Dormers and Chan kneeling, examining the prone body of a young nurse lying on the floor next to the service elevator. CHAN: Sadly so. Marks on neck indicate strangulation. JIMMY: (With a flash of insight) Norman! CHAN: (Looking up at Jimmy) Although your missing roommate may be responsible for much evil, in this tragic instance, suspect he is innocent in this instance. MEDIUM SHOT of Chan, Jimmy, and Dormers with the body. DORMERS: I think the kid's got something, Charlie. ...angle of mark on neck. When taking into consideration the height of the unfortunate victim when standing, murderer must have been at least six feet tall. CHAN: (Looking toward Jimmy) And, if memory of aged parent still reasonably sharp, recall description of young Norman indicate much slighter stature. MEDIUM CLOSE SHOT of Chan, Jimmy, and Dormers who all stand up around the body, Second Nurse next to them. ...also indicate substantial stature of same. Killer's accidental message on floor also tell us that vicious attacker fell upon innocent young nurse from elevator. Suggest we look for man six feet tall wearing new shoes, probably very shiny with much black polish. DORMERS: (Nudging his hat back a bit and looking perplexed) I gotta say, Charlie, this has me stumped. Why would someone want to kill this nurse? (Looking down at the floor) Boy, for a hospital, this place sure has dirty floors. CLOSE SHOT of Chan crouching and touching the floor. MEDIUM SHOT of the group around the body, Chan still crouching. CHAN: (As he stands back up) Ah! Thank you so much. DORMERS: (Puzzled) For what? Should I call the custodian? CHAN: No, but suggest instead that we add that our murderer has recently been to a nearby beach as suggested by grains of fine sand missed by eyes of humbly embarrassed detective. CLOSE SHOT of "Flat-Foot" Flynn, a disheveled cop, as he approaches the group. FLYNN: (Tucking his shirt and trying to look "official") Okay, where's the body? FULL SHOT on the entire group as Flynn walks up. FLYNN: I received a call that...(Suddenly seeing the body) OH, I see...! Well, let's get to work! FLYNN: (Cocking his police hat to one side with his hands on his hips) Who? What? HIM?? Oh, excuse me, I thought he was the laundry man! (To Chan, speaking in slow, simple English) You - from - Chinatown - beat? JIMMY: (Upset by the comment) Why...! CHAN: (Quickly interrupting by smiling and offering his hand) So pleased to make acquaintance of distinguished brother officer. Inspector Chan of Honolulu Police. In short time in your fine city, have heard much already of your sterling abilities. DORMERS: Who are you kidding, Charlie? This is Sgt. Flynn, the officer who works this beat. The college kids have taken to calling him "Flat-Foot." FLYNN: (A bit upset) Not to my face, they ain't! DORMERS: (Impatiently) Okay, okay! Like I told you, Flynn, Chan and I have this under control. I'll fill you in later at headquarters. CLOSE SHOT of Flynn and Dormers as Flynn turns his back on the corpse to confront Dormers. FLYNN: Well, if this don't beat all! Ten years on this beat and all I do is issue parking tickets! Suddenly, we have talk of a gang operating here, a driver runs his car into a guy on purpose, almost killin' him, and now a murder, and I'm completely out of the picture and upstaged by Mr. Wang over there! DORMERS: It's CHAN, Charlie Chan! Don't you ever read the papers? FLYNN: I don't care if his name's Fu Manchu! I've had enough! FULL SHOT as Flynn suddenly turns to storm off, tripping on and falling over the body! There are gasps and then suppressed laughter from Dormers and Jimmy. CLOSE SHOT of Flynn who scrambles back to his feet, his shirt pulled halfway out of his pants. He scrambles to his feet, tucks in his shirt, slams his hat back onto his head, and storms out. FADE to a FULL SHOT Chan, Dormers, and Jimmy exiting the hospital. MEDIUM SHOT of Chan, Dormers, and Jimmy as they walk down the steps at the entrance of the hospital. JIMMY: GEE! I almost forgot about Irene! I'm going back to see how she is! CLOSE SHOT of Nurse as she calls out to Chan and Dormers. NURSE: (Shouting) Mr. Dormers...Mr. Chan! Mr. Covert has taken a sudden turn for the worse! CHAN: Must hurry back to see old friend. MEDIUM SHOT of Chan, Jimmy, Dormers, and the Nurse as they hurry into Covert's room. A doctor is seen attending Covert. MEDIUM CLOSE SHOT of everyone at the bed of Covert. CHAN: (To Doctor, showing concern) Please, what is condition of patient? CHAN: (Interrupting) Sorry, but has patient received recent injection? DOCTOR: (Looking at Dormer's medical chart) Why...no... Why do you ask? ...show otherwise. Please note mark of recent puncture. CLOSE SHOT of Chan and the Doctor as the Doctor examines Covert's arm. DOCTOR: (Showing surprise) Why, you are right! MEDIUM CLOSE SHOT of Chan, Doctor, Jimmy and Dormers. CHAN: (Solemnly) Now, like lifting of fog, suddenly see mountain of truth in front of shamed face. Am certain examination will show unexpected presence of deadly drug. Was so stupid not to have realized that murder of unfortunate young nurse was simply a diversion. CHAN: Yes, all factors point this disappointed person to that conclusion. Will always blame self for demise of old friend. Killer obviously wanted no one in this room, so created heartless distraction at other end of same floor by killing nurse. At that time, should have seen through scheme... (Slowly shaking his head) ...but sadly did not. JIMMY: It's not your fault, Pop! You could only do so much. DORMERS: (Comfortingly) The kid's right, Charlie. None of us saw this coming. CLOSE SHOT of the Doctor. DOCTOR: (To Chan) As you say, sir, we will have to run tests. MEDIUM CLOSE SHOT of Dormers and the Doctor. DORMERS: (Pulling out a card and handing it to the Doctor) Here. Please call me as soon as you find something. FULL SHOT of the room as the Doctor and Nurse leave. Chan kneels and touches the floor. CHAN: Ah! Fears confirmed. Please note fine grains of sand, like those near other victim, also present here at bedside. (Rises and looks once again at the mark on Coverts arm) Also, mark of injection shows that procedure was performed in great haste, and direction of exit and ensuing scratch on arm indicate use of left hand. (Bending down and gently smelling the spot of the injection) And no trace of alcohol odor. DORMERS: I guess this settles it, then. I'll have the boys sent over on this one, too. CLOSE SHOT of "Flat Foot" Flynn hurrying into the room. He stops just inside the door. FLYNN: (Looking puzzled and disheveled. He straightens his hat) Whats this I hear about another murder?? MEDIUM SHOT of the group in the room and Flynn still at the door. DORMERS: That's right, Flynn. Another one. FLYNN: Well, just how d'ya know this is murder? DORMERS: (Indicating Chan) Well, Mr. Chan here has determined that, and I agree with him. CLOSE-UP of the spilled contents of the waste basket, clearly showing a handkerchief and a partially revealed hypodermic. MEDIUM SHOT of Chan, Dormers, Flynn, and Jimmy as Chan carefully examines this unexpected find. CHAN: (Holding the handkerchief and hypodermic carefully in his hands and bowing slightly to Flynn) Thank you so much. Seems brother officer can add one more merit to list of achievements. CLOSE-UP of a proud, smiling Flynn. CHAN: In his haste to leave room after heinous act against old friend, killer dropped instrument of death into waste basket. See, still retains ample measure of deadly fluid. Obviously did not want to become victim of own weapon by attempting to hurriedly replace into own pocket. DORMERS: I'll have this stuff analyzed, Charlie. JIMMY: (Excitedly pointing to the floor) Hey, Pop! Look! CLOSE SHOT of Jimmy falling to his knee and reaching under Covert's bed. CLOSE-UP of a button in the palm of Jimmy's hand. MEDIUM SHOT as Chan takes the button from Jimmy's hand and examines it closely. CHAN: (Proudly) Ah, youthful eagle's eye of number two son has furnished more information on killer. Thinness of button indicate same was divorced from sleeve of inexpensive suit. (Taking a small magnifying glass from his pocket and studying the button) Small scratches show much wear. (Looking at Dormers and then Flynn) Suggest we search for left-handed man, about six feet, wearing cheap dark suit, probably gray, also wearing new, very shiny black shoes, who has reason to visit nearby beach. FLYNN: Hey! Where do you think youre goin'? You ain't leavin' me out of this one! CLOSE SHOT of Chan and Jimmy. CHAN: Son, you know of beach nearby? JIMMY: Why, Pop, there are lots of beaches around here. But I think the closest is Venice Beach. Now that I think of it, Pop, Norman has mentioned going there before! CHAN: Please continue on interrupted errand to visit injured friend, Irene. (Looking at his wrist watch) Will meet you and brother Lee at appointed time at Mr. Winton's office. (Solemnly) At moment wish time alone to say final good-bye to departed friend. FADE IN on a MEDIUM CLOSE shot of Lee, Chan, and Jimmy in the back seat of Winton's car as Winton drives and his daughter Sally sits next to him. WINTON: (Shaking his head) Horrible business, this, Charlie. I am so very sorry to hear of your friend's death. CHAN: Appreciate very much your concern. Death one visitor all shun yet with whom all must one day walk. WINTON: That may be so, but this sort of thing just doesn't happen here, Charlie. We have a quiet community of intellectuals here. CHAN: Am certain that better fortune will smile once again on same. SALLY: (Hoping to lighten the mood) Well, Charlie, I think that you, Jimmy, and Lee will just love our house on Pinehurst Road! It's such a quiet spot, and it's right off Hollywood Boulevard, too, in case you would like to see a movie at the "Chinese," the "Egyptian," or the "El Capitan"! CLOSE SHOT of Lee, Chan, and Jimmy in the back seat. LEE: Hey, that'd be swell! It's been ages since I've seen a movie! JIMMY: Me too! I've been in the books so much lately, that I've skipped the finer things in life! CHAN: Sons have earned respite from harsh realities of life. Sounds like good idea to beleaguered father. You two have a good time, tonight, please, but please do not stay out late. Remember father's lecture tomorrow morning, for which must still prepare tonight. JIMMY: (Holding out his hand) How about some more dough, Pop? CHAN: (Reaching for his pocket book and opening it, then remembering) Ah! Very long day, but not long enough for parent to recall earlier stipend of twenty dollars. LEE: Gee, Pop. We spent most of it already! Los Angeles is an expensive town. CHAN: Aie... (To Lee) Here is five dollars for your movie tonight and ample snacks at same. JIMMY: (Snatching the bill from Chan's hand) THANK YOU SO MUCH! Chan and Lee glower at Jimmy as we FADE to a FULL SHOT of Chan, Lee, Jimmy, Sally, and Winton in front of a house with the address reading "2039." SALLY: I think you'll love it here. CHAN: Am quite certain of that. Feel strangely at home already. Not unlike humble home in Honolulu. WINTON: (Handing Chan the keys to the house) I have many fond memories of this house, Charlie. If you need anything, please ask our gardener, Roberto...Roberto Jaramillo. SALLY: He's also a very good cook...and he's such a devoted worker. Why, he was supposed to visit his family in Mexico, but he came back early! If you want to eat in, just ask him! CHAN: Will happily do so, thank you so much. CLOSE SHOT of Winton and Sally. WINTON: (To Sally) Well, dear, let's allow Charlie and his sons relax a bit. (Waving) Good-bye! We'll send a car for you in the morning, Charlie. FULL SHOT of the group in front of the house as Winton and Sally turn to get in their car. CHAN: (Smiling) Appreciate very much. CLOSE SHOT of Chan sitting at a desk lit only by a desk lamp. He is studying pieces of evidence that he kept from the scene of Ben Covert's murder, the handkerchief and the button. He looks closely at the handkerchief, it is spotless and new, still retaining crisp creases. CLOSE-UP of small Chinese characters that are translated to read "Regal Hotel Shanghai." VOICE: (Mexican accent) May I prepare dinner, Senior? MEDIUM CLOSE SHOT of Chan as he looks behind him to see a man dressed in work clothes. CHAN: (Rising to greet the unexpected visitor) Ah! You must be Roberto...Hairomelleo? ROBERTO: (Smiling) Si, Senior, Roberto Jaramillo! CHAN: (Shaking Roberto's hand and bowing) Please pardon awkward inexperience with Mexican language, Senior Roberto. ROBERTO: Is no problem, Senior. Would you like to eat dinner now? CHAN: (Smiling) Would be wonderful answer to stomach's hungry call. FADE to MEDIUM SHOT of CHAN seated at the dining room table as he finishes his meal and gently pats his mouth with a napkin. Chan looks closely at the napkin, gently touching then rubbing something with his finger. He looks at his finger and then rubs his finger and thumb together as Roberto enters the scene. ROBERTO: Do you want anything more, Senior? CHAN: Thank you, no. (Patting his stomach and smiling) Stomach very happy now! ROBERTO: Very well, Senior. I will leave you. If you need anything, please call for me. FULL SHOT of a medium-sized college lecture hall. About thirty students, including Lee and Jimmy in the front of the class, are seated with Chan at the blackboard. CHAN: Good morning. Two very simple words can define motives for murder. Simple words, yet both very complex in definition. There is old child-like saying: "Sticks and stones may break bones, but words will never bring harm." However, since oldest times, history of man too often written in words of blood that spell out two simple words: Greed and Anger. MEDIUM SHOT of Chan in front of the blackboard with a number of students visible, including Lee and Jimmy in the front. CHAN: Like north and south, greed and anger work in concert to provide mankind with ample opportunity do perpetrate much harm. You have all doubtless heard grim reports in newspapers of violence and death committed yesterday in area surrounding this very college. From information contained in pages of newspapers, which of these two motives do you think resulted in these crimes? FULL SHOT of students as one raises his hand. MEDIUM SHOT of the Student with others seated around him as he rises to answer. STUDENT: Well, sir, from what I understand, this could be a case of anger. Someone must have hated the guy that was killed...held some sort of grudge. CHAN: Possible. But what of young nurse? CLOSE SHOT of the Student. STUDENT: Why, I don't really know... Maybe he hated her, too. Maybe it was a love triangle. I've seen that happen before in the movies! FULL SHOT of the lecture hall as there is laughter. CHAN: Please! There are times when far-fetched theory of crime, even if derived from Hollywood movie, is revealed in end to be correct. However, in this case can humbly assure young man that his theory is as wet as cat in typhoon. WIDE SHOT of Charlie Chan at lectern at front of classroom. President Winton, Sally Winton, Lee and Jimmy Chan are seated in a row of chairs behind him. Irene is seated next to Charlie at a desk, taking notes in a stenographer's notebook. CHAN: Before ending humble efforts to share knowledge of crime-detecting, wish to thank honorable benefactors, President Coleman Winton and his daughter, Sally Winton. And to bright class of students in front of humble self, willsee you tomorrow! REVERSE SHOT of students as they stand, cheering and clapping. MEDIUM SHOT of the Wintons, Lee, and Jimmy as they come forward to Chan. Irene closes her notepad. CLOSE SHOT of Winton and Chan. WINTON: (Shaking hands with Chan) You've more then proven my point about what a good teacher you'd be if you had the chance! CHAN: (Shaking his head) House cat is still house cat next to lion of college jungle! MEDIUM CLOSE SHOT of Chan, Winton, Lee, and Jimmy. LEE: (Smiling fondly at Chan) We knew you were good, Pop! JIMMY: (Flinging his hands into the air, as he looks toward Winton) Where do you think we got OUR crime-busting brains from? Chan shakes his head at his number two son. CHAN: (to Winton) Humbly beg to forgive overactive imagination of number two son. WINTON: (Smiling as he glances at Jimmy and then Lee) You have a fine pair of boys, Mr. Chan. CHAN: (Smiling) Several more where these came from. Perhaps is true that coconuts of Honolulu palm fall close to proud tree. FULL SHOT of the group as a man approaches them and extends his right hand to Chan. LEYLAND SANDERS: Mr. Chan, I'm so sorry not to be here sooner. WINTON: Charlie, this is Dean Leyland Sanders who is head of the department. (Glances at Sanders) Mr. Sanders, I also want you to meet Charlie's sons, Lee and Jimmy Chan, as well as Irene Chow, who will be Mr. Chan's secretary. MEDIUM SHOT of Sanders, Sally, and Irene as Sally looks sharply at Sanders when he eyes Irene. SANDERS: Family emergency that couldn't be helped. But I'm here now! (He smiles smugly) What's on the agenda next? FULL SHOT of the whole group. WINTON: First, let's get our honorable guest out of here. Then we'll go to my house for lunch. MEDIUM CLOSE SHOT of Lee, Sanders and Irene as Lee notices Irene edging away from Sanders and moves over to her. IRENE: (With a slight nervousness) I'd better get these notes typed up as soon as possible, Mr. Chan. CHAN: Number one son thinking good idea to make sure contentious secretary taken to lunch? SANDERS: (As he moves toward Irene as though to take her arm) Why not take lunch with us? You would make a very lovely lunch companion. Chan steps between them as he locks eyes with Lee for a moment. Lee gets Irene's other arm and heads her to the door. WIDE SHOT of everybody trying to hide smiles except for Sanders. CHAN: Miss Chow will probably enjoy lunch better after at least starting to pin poor words of humble cop to page of typewriter. SALLY: (Taking Chan's arm) Is lecturing on crime easier then you thought? CAMERA PANS as the group moves toward the door. CHAN: (Grinning at Lee and Irene, nearing the door) Remember on lecture to fellow policemen in Honolulu that number one son broke up while he was in clutches of gambling fit. (Smiling at Sally) Poorly paid old Chinaman not only lost train of thought but fifty cents on snozzolola of unknown horse. MEDIUM CLOSE SHOT of Lee, Chan, and Irene, as Lee reaches for the doorknob. LEE: (As he opens door for Irene) But you knew his owner, Major Kent. CHAN: Yes (Looking into the distance, in thought) Lost old friend that time also. FULL SHOT of the group at the door. SALLY: (Patting Chans arm as her eyes tear up) But you brought HIS murderer to justice, didn't you? And I know you will do the same this time, too. JIMMY: And just think... You'll have MY help as well as Lees this time! Lee closes the door behind them. FADE to a FULL SHOT of the group at the front door. CHAN: (Grinning at Winton) Humble stomach say, Thank you so much! FADE IN to a FULL SHOT shot of the group at curb next to Winton's car. Sally dawdles to buy time to speak to Chan privately. CLOSE SHOT of Sally and Chan. SALLY: (In a serious tone) Charlie, I saw Leyland yesterday after you were nearly run down. SANDERS: (Suddenly calling out) We can't let our star lecturer go hungry. MEDIUM CLOSE SHOT of Chan and Sally. CHAN: (Bowing) So kind of you. MEDIUM SHOT of Lee and Irene going into the administration building. MEDIUM CLOSE shot as Lee stops just inside the door and carefully looks out. IRENE: What do you think you're doing? LEE: (Still looking out of the window) Do you see that guy loitering outside the Student Union Building? CUT to a FULL SHOT of the front of the Student Union Building showing a man standing alone with his hat rather conspicuously pulled down. CLOSE SHOT of Irene and Lee at the window as they both peer out. IRENE: You know, Lee, I think I've seen him lately. MEDIUM CLOSE SHOT as Irene and Lee look at each other. CLOSE SHOT of the tall stranger who stands alertly, suddenly looking in the direction of Coleman Winton. MEDIUM SHOT as Coleman Winton gets behind the wheel of his car. CLOSE SHOT of the stranger nods to someone else. MEDIUM SHOT of an accomplice to the stranger who gets into a car to follow the Wintons. MEDIUM SHOT of Lee and Irene who duck back as they see the stranger come toward the Administratiion Building. Lee suddenly realizes something! LEE: That's the car that tried to run Pop down!!! FADE IN to the interior of Winton's automobile shot from front. SALLY: Dad did you see how proud Lee and Jimmy were of their dad? WINTON: Yes, Sally the love and respect is obvious. Very special indeed. SALLY: I feel the same about MY pop you know. WINTON: Now, Sally, you're making me blush. SALLY: No really. And I respect your opinions. WINTON: Now, do I detect a motive behind these honeyed words? WINTON: (Smiling) Now what's this about? SALLY: How well do you know Dean Sanders? CLOSE SHOT of Winton with quizzical and surprised look. SALLY: I mean do you completely trust him? WINTON: (With a pensive look) It's an odd question but since you ask... Leyland came here from out east with the impeccable credentials in his field of political science and philosophy. I spoke with a number of his colleagues and they certainly concurred with his resumes. His performance as dean has been quite good. He has a private sort and hasnt been easy to get to know personality. Why the concern Sally? SALLY: Just this Dad. For a man of his background and position I find his manners at times crude. Did you notice how he approached Irene Chow just now? And she reacted just as I would have. WINTON: Now, now is that all? WINTON: Pure coincidence I'm sure. All these crimes have gotten everyone's wind up. MEDIUM SHOT of Sally who is suddenly concentrating on the rear view mirror then glances back over her right shoulder. SALLY: (With a look of concern) Dad, I could be mistaken, but I think we're being followed! FADE IN to scene at lunch table in faculty dining room. Charlie Chan sits opposite Leyland Sanders. MEDIUM-CLOSE SHOT of Chan and Sanders. CHAN: Once again am indebted to generosity of noble university for excellent repast. SANDERS: (With a self-satisfied smile) Just a small benefit to supplement the modest wages of academia, Charlie. CHAN: Political science and philosophy of great merit but not remunerative? CHAN: Extra benefits not unwelcome. SANDERS: (Looking at Chan sharply with a sardonic smile) Just so, Charlie. CHAN: (Wiping his hands and mouth with a napkin) World situation now present most interesting contrasts for study of political scientist. SANDERS: Yes, Charlie, it does. CHAN: (Looking intently toward Sanders) Have theory on outcome? SANDERS: Yes, Charlie, I do. (Stops to take a sip of his wine) Strength of arms is, of course, a prerequisite. But, then many nations have strength of arms. MEDIUM SHOT of Chan and Sanders as Sanders takes another sip then takes out a couple of cigars offering one to Chan. CLOSE SHOT of Chan. His close scrutiny of Sanders is momentarily interrupted by the need to politely decline, with a subtle gesture of his hand, the proffered cigar. CHAN: More than strength alone is needed? CLOSE SHOT of Sanders who has assumed a very intently serious air. SANDERS: Strength is worthless without the intelligence and the ruthless will to employ it properly. MEDIUM SHOT of Chan and Sanders. CHAN: (With great seriousness) Many innocents will suffer. SANDERS: Mr. Chan, the world never lacks for innocent lives. A rather expendable commodity dont you think? CHAN: (Sadly) Most unfortunately...true. However, a wise sage of old stated, "The truly powerful win by compassionate means." But, this is most unhappy subject for midday repast and I must be going. My secretary wished to go over her notes with me. FULL SHOT of room as Chan and Sanders rise from their chairs. Both proceed across the room toward the exit. SANDERS: (Conversing as they walk and intermittently puffing on his cigar) Ah yes, the lovely Miss Chow. A most charming young lady. CHAN: (Quick glance of disapproval, which is missed by Sanders) Most forgetfully I neglect to ask you if you may have been acquainted with most excellent professor of philosophy at University of Michigan. You were there yourself were you not? SANDERS: (A bit over-gregarious now. A result of wine and nicotine) Yes I was, Charlie. Good old Ann Arbor. Who might that be? MEDIUM-CLOSE SHOT of Chan and Sanders as they emerge on the other side of the door. SANDERS: Caruthers, let's see. Oh, of course. Old "Batty Caruthers" we called him. Charming fellow. MEDIUM SHOT of Chan as he stands reflecting deeply on the moment. He is joined by Lee and Irene. LEE: (Animated) Gee Pop are we glad to find YOU! CHAN: Evidently have some news to impart? CLOSE SHOT of Irene who is equally excited. CLOSE SHOT of Lee as he interrupts. CLOSE SHOT of Irene as she interjects. MEDIUM-CLOSE SHOT of all three, Lee on one side of Chan and Irene on the other as Lee completes Irene's statement. Chans head turns from one to the other as if watching a tennis match! CHAN: (Holding up a hand) Stop! Very difficult to travel both east and west at same time. One reporter only will save humble detective from stiff neck in morning. LEE: You tell him, Irene! Irene: It's a man I've seen around campus for the past two weeks. He looked vaguely familiar but I haven't had a really close look at him. Anyhow, when I saw him today, I remembered seeing him talking to that creepy character Harry Walden. LEE: Say! That's the guy Jimmy says has been hanging around campus flashing dough and bragging a lot. CLOSE SHOT of Irene and Chan. IRENE: That's the man. Well, just as I made the connection the man with the hat turns and walks down the steps of the Union a short way and its obvious he's watching somebody. CHAN: (Interested) Go on please! LEE: (Excited and unable to restrain himself from interjecting) The stranger signaled to a car parked nearby. A dark sedan like the one that nearly ran you down yesterday! Then the car drove off in the same direction as the Wintons. MEDIUM SHOT of Chan, Irene, and Lee. IRENE: And we're certain it was following them! LEE: We flagged down "Flat-foot" Flynn but he didn't seem to be too interested. IRENE: (With an angry expression) Told us to mind our washing...or something like that. What a sap! CHAN: This most serious turn of events. I will ask you to impart information immediately to Captain Dormers. Tell him, also, that he can reach me at the house on Pinehurst Road. Suggest, further, you make inquiries into identity of stranger with hat. Go now. Emulate hunter when quarry on run and move quickly. MEDIUM-LONG SHOT as scene shifts to the outside of Ling Toy's store as Irene and Lee approach the entrance. MEDIUM SHOT of Irene and Lee as they enter the door. IRENE: Lee, are you certain Captain Dormers got the message? LEE: Absolutely! I spoke to him myself and he said he was going to put an immediate alert out to locate the Wintons. MEDIUM-CLOSE SHOT of Irene and Lee inside the "Toy Store." IRENE: This ought to about the best spot on campus to get what we're looking for. LEE: You're right there, Irene. Say, where is everyone? FULL SHOT of the empty store. As they look around, Ling Toy comes out of the back room and is about to speak when he is distracted by San Toy coming through the front door with a pensive expression she looks up and is clearly pleased to see Lee and Irene. LEE: San Toy! Are we glad to see YOU! Something's come up and we need some information and thought you could help. CLOSE SHOT of San Toy. SAN TOY: (Her interest perked) Sure, Lee. Golly I was looking for you, too. MEDIUM SHOT of San Toy, Irene, and Lee standing as a group. ...and so you see why that fella's identity is so vital. SAN TOY: As a matter of fact, he has been in here a couple of times. Gave his name as Ralph Thompson and asked if I knew Harry Walden or Tom Mallory. IRENE: Tom Walden! Wasn't he dating Sally Winton? MEDIUM SHOT of San Toy, Irene, and Lee. SAN TOY: Gee, you're right. Anyhow, he gave me his local phone number and a nice tip. Seemed like a nice guy. But, I wanted to ask if you've seen Jimmy. LEE: (Concerned) Gosh, no, not since we left you. Why? SAN TOY: We were outside his dorm when that roommate of his - Norman - came up with a message that Mr, Chan wanted to meet him right away at the house on Pinehurst Road. Norman offered to drive him there, and off they went. LEE: (Puzzled) Gee...that's odd. Pop didn't say anything about meeting Jimmy there. FADE IN an Winton and Sally driving in by in their car. MEDIUM-CLOSE FRONTAL SHOT of Winton and Sally in the car. WINTON: Sally, I think we had better double back towards campus. Whoever that is behind us probably won't interfere with us there. FULL SHOT of the convertible making a sudden U-turn and speeding off in the opposite direction. The trailing dark sedan follows. SCENE SHIFTS to another car driving rapidly along. SIDE TRACKING SHOT reveals Jimmy and Norman, the driver. MEDIUM-CLOSE SHOT from the front looking through the windshield. JIMMY: Gee, Norman, it was nice of you to give me a lift. I wonder what Pop wanted me for? MEDIUM-LONG SHOT of the car as it makes a sudden turn onto another road. CLOSE SHOT of Jimmy from the front. JIMMY: (Concerned) Hey, Norman, what gives? This isn't the way to Pinehurst Road! NORMAN: (Smirking) You're right, James. We're taking a little detour. MEDIUM-CLOSE SHOT of Jimmy and Norman. JIMMY: We haven't got time for side trips. Turn around! JIMMY: What's the big idea, Norman!? NORMAN: Some friends of mine have arranged a date for you with your girl friend San Toy. I'm here to make sure you're not late. But, I'm not a bad fellow. In fact I'm going to be very polite and ask you to drive. I'll direct you. FULL SHOT of the car pulling onto a gravel side road. The car comes to a halt. Norman steps out, covering Jimmy with the gun, and motions Jimmy out of the car and into the driver's seat. MEDIUM SHOT from the front as Norman slams the door after getting into the passenger seat, still covering Jimmy. MEDIUM-CLOSE SHOT from the front of Jimmy and Norman. CUT to a FULL SHOT the Wintons' convertible pulling up in front of a large college building. "Flat-foot" Flynn is standing nearby on the sidewalk. FLYNN: Hold on there, you two, this is a no parking zone. MEDIUM-CLOSE SHOT of Winton, Sally, and Flynn. WINTON: I realize that, officer. However, if I might explain. FLYNN: Say! Ain't you Sally Winton? MEDIUM SHOT of Sally, Winton, and Flynn, as Tom Mallory walks into the scene. TOM: Can I help out? WINTON: (Coolly) Oh, it's you, Mallory. MEDIUM SHOT of all four standing by the Wintons' car. TOM: Flynn, this is Sally's father Coleman Winton, President of the University. You have heard of him, haven't you? MEDIUM-CLOSE SHOT of the group. FLYNN: Sure, sure. Head guy around here. But, president or not you've got to move the jalopy! SALLY: (To Tom) Oh Tom. Dad and I were just out for a drive and noticed someone following us. We came back and now seemed to have lost him. TOM: (His interest perked) That's strange. Have you informed the police? WINTON: (Annoyed) No, we haven't. And that includes the imbecilic - Flynn - here. FLYNN: (Angrily) Say, I resent that! MEDIUM-CLOSE SHOT of Tom, Winton, and Sally. TOM: (To Winton) Where were you headed? WINTON: (Coldly) Not that it concerns you, but, we were going up to my old house on Pinehurst. SALLY: (Sharply) Oh, Dad, come now. Tom is only trying to be helpful. FULL SHOT as Winton, Sally, and Flynn are conversing. Lee, Sam, and Irene are seen approaching from across the street. They are moving quickly. MEDIUM-CLOSE SHOT of Lee, Sam, and Irene. LEE: Sally! Are we glad to see YOU! We spotted a car that looked like it was following you. Did you see it? MEDIUM-CLOSE SHOT of Sally and Winton. WINTON: We certainly did, young man. You were correct in your assumption. SALLY: Dad managed a quick turn and lost him. IRENE: Thank goodness. Any idea who or why? CLOSE SHOT of Irene and Lee. SALLY: None at all. But, with all that's been going on we didn't want to wait to find out. LEE: Tom, do you know a fellow named Ralph Thompson? TOM: (Concerned. Begins to speak but is overcome by a brief paroxysm of coughing) Sorry Lee. No I haven't had the pleasure. Who is he? IRENE: Someone who's been hanging around campus asking lots of questions, and we think was connected with the person who tailed the Wintons. TOM: That IS odd. But, say I've forgotten what I came for. Jimmy asked me to tell you San Toy that he needs you right away. Something to do with an experiment of some sort. SAN TOY: Terrific! Where is he? CUT TO A LONG SHOT of the house on Pinehurst road. Chan approaches the front door. He unlocks it and enters. MEDIUM SHOT from inside the front entrance. Chan proceeds towards the living room where he encounters Jarmillo. CHAN: So sorry to disturb you. May impose on you to fetch pen which clumsy detective drop under couch? Sixty years of healthy appetite make bending difficult. MEDIUM-CLOSE SHOT of Jarmillo as he kneels to reach under the couch. JARMILLO: Si senor Chan. I will get it for you. But, I do not see it. MEDIUM-CLOSE SHOT of Chan as he reaches into his jacket pocket pulls out his revolver. CHAN: I note you reach with left hand, Senor Jarmillo. MEDIUM SHOT of Chan and Jarmillo as the latter stands up, unaware that Chan is covering him. JARMILLO: Si senor, I am left handed but... (Suddenly alert and surprised. His accent disappears.) What's this! CHAN: You will keep hands up, please. (He carefully approaches Walden and reaches foreword, extracting a small pistol from his work jacket's pocket) You may put down your hands now. Presence of theatrical make up on plate and utensils suggest use of disguise. Your real name, please! WALDEN: You're the great detective. YOU figure it out. CHAN: No matter. By any name, snake still snake. Authorities will soon determine same. MEDIUM-CLOSE SHOT of Chan and Walden. WALDEN: (Seeming to be looking at something in back of Chan) Don't be so sure, Mr.Chan! VOICE: (From behind Chan) You will please drop your weapo...and don.t turn around. Harry, take that lamp cord and make Mr. Chan comfortable. CLOSE SHOT of Chan and Walden as Walden pulls the cord from a floor lamp and begins to expertly binding Chan's arms and legs. WALDEN: (Finishing his task) All set. This will hold him for a while. Have you got the kid? VOICE: Quiet, you fool. Let's go. Until we meet again, Mr. Chan. CAMERA PANS as Walden moves towards the "Voice" who is seen vaguely in the shadows from the back. FULL SHOT of the exterior of the house. The two are seen from a distance entering a dark sedan. FULL SHOT as CAMERA PANS showing the car moving off and rounding a corner just as a police car enters the scene and pulls up at the house. CLOSE SHOT of the interior of the police car as Dormers gets out and turns to the driver. DORMERS: Wait here, Sergeant. I shouldn't be too long. MEDIUM SHOT of Dormers as he notes that the front door to the house is ajar. His instinct tells him that all is not well and he quickly enters, gun drawn. MEDIUM SHOT of a bound Chan. CHAN: Red-faced detective overjoyed at timely arrival of brother officer. MEDIUM SHOT of Chan and Dormers as Dormers holsters his gun and hurries to Chan. DORMERS: (Untying Chan) What happened, Charlie? CHAN: Discovered servant Jarmillo impostor. Then was surprised by his unseen partner. CHAN: Not certain, but fear part of very dangerous gang who are responsible for deaths of Ben Covert and unfortunate nurse. MEDIUM SHOT of the police Sergeant as he enters the front door. SERGEANT: Everything all right, Captain? CLOSE SHOT of Dormers with Chan. DORMERS: Far from all right, Sergeant. Get on the car radio. Tell all cars to watch out for a pair of guys, one of whom may be dressed as a Mexican gardener. MEDIUM-CLOSE SHOT of Chan on all fours inspecting the floor. CHAN: (Speaking as he stands up) Fear disguise already discarded. Unneeded remains of so-called Roberto Jarmillo no doubt now reside in trash can. DORMERS: I suspect you're right, Charlie. Say, what were you looking for just now? MEDIUM SHOT of the room as the Sergeant joins Chan and Dormers. ...small amount of sand found on floor. MEDIUM-CLOSE SHOT of Chan, Dormers, and the Sergeant as Chan. CHAN: (Holding the sand up to Dormers) Note, please, that sand is of peculiar reddish color just as we found near most unfortunate nurse. Can possibly suggest source? MEDIUM SHOT of Chan, Dormers, and the Sergeant. SERGEANT: I think I can help out, Captain. About 30 miles from here in the direction of San Diego is "Red Sands Beach." Not far from the Naval instillation there. CHAN: (With great urgency) Most important we go there immediately. DORMERS: Bit out of my territory. But sure, let's go. I'll radio ahead for assistance. CUT TO an ESTABLISHING SHOT of a large and apparently deserted beach. FULL SHOT of a clump of trees surrounding a sand road leading to the beach. MEDIUM SHOT of the clump of trees, revealing, half hidden, Norman's empty automobile. FULL SHOT as the sound of another car is heard as a dark sedan comes along the road and pulls to a stop behind the first. MEDIUM-CLOSE SHOT as Tom Mallory gets out. FULL SHOT as Tom holds a gun and is forcing a reluctant San Toy to proceed down the road towards the beach. They detour to the right along the edge of the trees and stop at a large rock formation. MEDIUM-CLOSE SHOT of Tom and San Toy as Tom reaches down and touches a portion of the rock next to an outcropping. MEDIUM SHOT as, suddenly, the face of the rock swings foreword revealing an entrance to a passage. At Toms urging, San Toy proceeds inside, followed by Tom. The face of the rock closes behind them. FULL SHOT of a large bunker-like room lined with an impressive array of machine tools as well as electronic and chemical paraphernalia. MEDIUM-CLOSE SHOT showing, seated in one corner, Jimmy Chan who is bound and gagged. The improbable sound of classical music is heard. CAMERA PANS, showing Norman who appears to be listening to a record on a portable Victrola. He looks up as a door opens and cuts off the music. NORMAN: (Sarcastically) Glad you could make it, Miss Toy. I was just entertaining my good roommate with some of his favorite Mozart Etudes. Unfortunately he wasn't in a receptive mood. Perhaps due to the working over he got earlier for not cooperating. But now he is a "captive" audience as you can see. SAN TOY: JIMMY! What have they done to you? Are you all right? CLOSE SHOT of Jimmy on the floor, bound. Showing some physical signs of an earlier struggle. JIMMY: (Looking up) San Toy! I've felt worse. A Chan doesn't talk to - or help - thugs. NORMAN: THUGS, indeed, James, old boy! Your cutting remark pains me deeply. CLOSE SHOT of Tom Mallory. TOM: Okay, Norman, cut the comedy. I take it he didn't play ball. SAN TOY: (Seeing Jimmy angrily turns to the two men) What have you done to Jimmy. Why are we here? TOM: Nothing much...YET. Depends on your cooperation. NORMAN: (Interrupting) We brought you here to provide the information. SAN TOY: And if I DON'T? TOM: (Smiling, nodding toward Jimmy) Your friend will suffer the consequences. SAN TOY: I suppose I have no choice. (Looking around the room) It looks as though you have a pretty complete lab. Give me an hour to work on it. NORMAN: Now you're talking sense, Miss Toy. TOM: Look, Norman, you keep an eye on her. (Coughing again) I'll contact the chief. FULL SHOT of the college campus near the student union. MEDIUM SHOT of Lee, Irene, and Sally who are still together. LEE: Gee, Irene it's been hard to think about my painting with all this going on. I even had to skip a newspaper interview with Sam. Pop and Jimmy are over at the house, and this mysterious character hanging around... (Stops suddenly, looking toward the distance) Say, Irene, isn't that the guy who calls himself Ralph Thompson headed this way. FAR SHOT of Ralph Thompson walking toward the camera. CLOSE SHOT of Irene looking in the direction of Thompson. IRENE: Right, Lee, that's him all right! MEDIUM-CLOSE SHOT of Sally, Lee, and Irene. SALLY: (Her back has been towards the approaching figure) Really, where, Lee? (She turns around then she breaks into a smile of recognition as Brandon walks into the scene) Brandon! (She moves foreword, they meet stand face to face for an instance then embrace) Brandon, dear. MEDIUM-CLOSE SHOT of Brandon and Sally. SALLY: (Suddenly pushes Brandon off, and in a scolding tone) Brandon Mitchell! What's all this cloak and dagger behavior? "Ralph Thompson," indeed. BRANDON: I'm sorry, Sally, but I had too. I'm on a naval intelligence assignment trying to get the goods on a local espionage gang. LEE: (Excited) Say, do you suppose they had something to do with the murder of Pop's friend, Ben Covert? BRANDON: No doubt about it. So far I've identified Harry Walden. BRANDON: Yes, most probably Tom Mallory. Lee: (Interrupting) Gosh! He left with San Toy. Said Jimmy needed her. IRENE: I don't like this, Lee. BRANDON: Nor do I. Did he say where they were going? LEE: The house on Pinehurst. Jimmy went there earlier with his roommate Norman to join Pop. Say, do you suppose it's a trap? MEDIUM SHOT of the group as they are joined by another man. The driver who had previously followed the Wintons. He is in a hurry and immediately reports to Brandon. BRANDON: (Turning to the man) What's up, Dan? DAN: Radio alert just came through. Big dust up at Pinehurst Road. Chan had a run-in with a fake gardener who escaped. Probably Harry Walden. Anyhow, they're headed to Red Sand Beach. BRANDON: (Excited) That's close to our naval installation. We've got to get there pronto! You folks up for some action? Dan, is the Fairchild serviced? CLOSE SHOT of Brandon and Dan. DAN: Yes, sir. I'll radio the field to have it fired up. FULL SHOT of the group as they all begin to move towards the dark sedan. MEDIUM SHOT as they all hurriedly pile into the car. FULL SHOT as the car roars off. FADE IN to a FULL SHOT of the exterior of the secret entrance of the hidden bunker within the cave at Red Sands Beach. Tom Mallory is standing outside the rock puffing on a cigarette as he is joined by Walden. MEDIUM SHOT of Tom and Walden. TOM: Yes. Let's go in! TOM tosses the remains of the cigarette on the sand as Walden manipulates the hidden latch. MEDIUM SHOT of the inside of the hidden laboratory. Sam is working at the chemical bench. Norman who has been eyeing Sam gets up as Tom and Walden enter. MEDIUM SHOT of Norman, Tom, and Walden. NORMAN: Nothing yet, Tom, except for some impressive sound effects. Gurgling and hissing mainly with an occasional burp thrown in. CLOSE SHOT of a busy San Toy who glances toward the three men. WALDEN: (Annoyed) Okay, funny man. Just keep an eye on her. MEDIUM-CLOSE SHOT of Norman, Tom, and Walden. NORMAN: (With a leering smile) Gladly! FADE IN to a FULL SHOT of Red Sand Beach as Chan and Dormers have arrived. They get out of car and begin to look around. CHAN: Presence of automobiles shout obvious message that beach is not deserted. CLOSE SHOT of Chan as he bends down and picks up some sand, producing a small magnifying lens and inspecting the granules. MEDIUM-CLOSE SHOT of Chan and Dormers as Chan stands up. CHAN: Would appear grains of sand found at both hospital and at house on Pinehurst Road are of same family as sand of this beach. Please, follow me. FULL SHOT as Chan and Dormers walk over to one car then the other feeling the hoods. MEDIUM-CLOSE SHOT of Chan and Dormers at the second car. CHAN: Presence of warmth on this car suggest recent arrival of same. MEDIUM SHOT as Chan carefully goes to the driver's door and begins to follow a trail of foot prints in the sand. CHAN: Observe, please! (Pointing) Single set of foot prints leads to large rock. They are joined by second set which lead to face of rock and no further. DORMERS: Maybe they climbed up, Charlie. FULL SHOT as Chan and Dormers walk, looking at the trail of foot prints, until they reach the rock out cropping. CLOSE SHOT of Chan's hand as it feels the smooth sandstone of the rock out cropping. CHAN: Most unlikely. Rock face worn smooth by ocean wind and sand. MEDIUM-CLOSE SHOT of Chan and Dormers as Chan bends over and picks up a small object on the sand. CLOSE SHOT of a cigarette stub in Chans hand. CLOSE SHOT of Chan holding up th cigarette stub. CHAN: Note remains of deceased cigarette. (Sniffing the stub) Apparently very recently discarded. MEDIUM-CLOSE SHOT of Chan and Dormers as Chan examines the rock more closely. MEDIUM SHOT of Chan and Dormers from behind, as the rock face swings open. DORMERS: (Greatly surprised) Well, I'll be. Will you look at that! MEDIUM-CLOSE SHOT of Chan and Dormers at the entrance. CHAN: Most cleverly hidden entrance. DORMERS: I'll alert my sergeant to check on our backup. 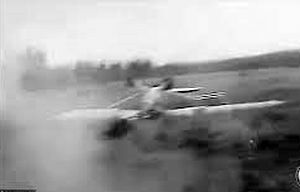 FADE IN to a FULL SHOT of the scene at small airport as Brandon, Sally, Lee, and Irene exit their car which has pulled up beside the Fairchild 24 cabin monoplane carrying naval markings. The engine is running and mechanic holds open the entry door as Sally, Irene, and Lee board. MEDIUM-CLOSE SHOT of Brandon and the Mechanic as they are about to board the plane. BRANDON: (Shouting above the engine) Everything set? MECHANIC: Aye aye, sir. Topped off and warmed up. BRANDON: Okay. We're headed for Red Sands Beach. FULL SHOT of the plane as Brandon scrambles aboard. The mechanic slams shut the door. Then bends to remove the wheel chocks. The plane leaps foreword. LONG SHOT as the plane takes off towards the camera. LONG SHOT as the plane roars overhead in a sharply banking turn. MEDIUM SHOT ot Brandon, Sally, Irene, and Lee in the cabin of the Fairchild. LEE: How far is it Brandon? BRANDON: About fifteen minutes more or less. SALLY: Is there an airport nearby? BRANDON: No need for one. It's low tide and I can put down easy on the packed sand. I know the area well and it's a technique we practice in naval aviation. IRENE: Swell. That'll save time. FAR SHOT of the plane speeding along. CUT to a MEDIUM-CLOSE SHOT of San Toy at work in the hidden laboratory. She is adding fluid from a beaker into a large flask. SAN TOY: That about does it. Far as I recall, this is Jimmy's formula. MEDIUM-CLOSE SHOT as Tom and Norman hurry to San Toy at the work bench. They are joined by Walden. TOM: Looks weird enough. Kind of reddish-purple. NORMAN: (Examining the flask) No, I'd say vermilion. WALDEN: (Snatching the flask) You two knock it off! This ain'tan art exhibit. We'll try it on this test motor. FULL SHOT of the laboratory as Walden indicates a small single-cylinder engine mounted on a test stand. Tom and Norman crowd around as he does so. Tom begins a coughing jag. MEDIUM SHOT of the group as Tom and Norman step away from the busy Walden. TOM: (Gasping) Say, that stuff smells strong. Kind of takes your breath away. WALDEN: (At work on the motor) Yeah, and your pipes aren't too strong to start with. (Sniffing the air) But, I see what you mean. MEDIUM-CLOSE SHOT of Norman and Tom. MEDIUM SHOT of Walden working intently on the motor. MEDIUM SHOT of Walden standing over the fallen Tom and Norman. FULL SHOT of the room as San Toy, wasting no time, rushes over to untie Jimmy. He just gets free and stands up with difficulty as Chan and Dormers enter. MEDIUM SHOT of Jimmy, San Toy, Chan, and Dormers as Chan and Jimmy embrace. JIMMY: (Dusting himself off) Pop! Am I glad to see you! These guys are a gang of spies and were trying to steal my formula. CHAN: (Smiling broadly) Note that fate has not treated you kindly, but sight of number two son, like rays of sunshine after bad storm, most welcome to worried parent. JIMMY: (Looking down at the unconscious trio) Gee, San Toy, what did you put in that stuff? SAN TOY: (With obvious pride) Oh, just some ether, a little food coloring, and a smidgen of chloroform. MEDIUM SHOT of the group standing over the three fallen thugs. MEDIUM-CLOSE SHOT of Chan, San Toy, and Jimmy. CHAN: (To San Toy) Wisdom and beauty most happy combination. SAN TOY: (Blushing) Thank you, Mr. Chan. MEDIUM SHOT of the group standing above the cuffed gang members. CHAN: (To Dormers) Most of gang now captured. But, one still at large. Suspect spider will soon return to web. CUT to a FULL SHOT of the plane as it begins its approach to the beach. MEDIUM-CLOSE SHOT of the cabin of the plane. BRANDON: Looks pretty clear along the tide basin. We'll put down near the edge of the water. Tide's still running out so were good for several hours. Buckle in now and hold tight. LONG SHOT of the Fairchild landing. FULL SHOT as the plane rolls to a stop and the members of the group clamber out. MEDIUM SHOT of the group standing outside of the plane at the plane's door. BRANDON: Stay together, now. We'll head for those trees near the beach. CUT to a scene by Dormers' police car. His sergeant is standing beside it. He looks up as two figures, seen from behind, approach. MEDIUM SHOT of the Sergeant as the two men, still seen from behind, walk up to him. SERGEANT: (Addressing the men) Hello! What are YOU doing here? CUT to a FULL SHOT of Brandon, Lee, Sally, and Irene as the group approaches the trees. MEDIUM-CLOSE SHOT of Lee and Brandon. LEE: Say, Brandon, I think there are some cars over there. BRANDON: Hold it! Everyone down! MEDIUM SHOT of the group as they duck down behind low-lying bushes. Brandon removes a pair of binoculars from a case on his belt and scans the area. INSERT of the view through Brandon's binoculars of two figures approaching the secret rock entrance. The door swings open and they disappear within. MEDIUM SHOT of the group, still crouching, as Brandon takes the binoculars away from his eyes. BRANDON: Well I'll be. Two men just went into a rock. Some sort of hidden entrance to what I suspect is a cave. SALLY: (Smiling a bit nervously) Don't worry about US! IRENE: (Glancing nervously at San Toy) You said it. FULL SHOT as Brandon, Lee, Sally, and Irene approach the cars on their way to the rock. LEE: (Pointing ahead) That one looks like a police car and... Say, I think someone's in there. Looks like he's asleep. FULL SHOT as the group nears the cars. MEDIUM-CLOSE SHOT of Irene and Lee. IRENE: Not asleep Lee, UNCONSCIOUS. MEDIUM SHOT of the group standing at the police car over the Sergeant whose prone body leans against it. BRANDON: Looks like someone slugged him, all right. We had better have a look at that rock. CUT to a FULL SHOT of the laboratory as Norman and the others are beginning to stir. They are still under the watchful eyes of Chan and Dormers who are each holding guns. Jimmy and San Toy are watching from the laboratory bench. CLOSE SHOT of Walden as he comes to. MEDIUM SHOT of Chan and Dormers standing above the three gang members who are cuffed together. DORMERS: All right you birds, just get up slowly and try not to get tangled up. NORMAN: I don't feel so well. MEDIUM-CLOSE SHOT of the gang members and Dormers at the thugs slowly begin to stand. TOM: (Still groggy) Anybody got a cigarette? DORMERS: Come on, get moving. The State of California will soon be seeing to all your needs. MEDIUM SHOT of Chan, Dormers, and the gang members as, suddenly, a voice from behind is heard. MEDIUM SHOT of Flynn and Leyland Sanders emerging from the darkness. CLOSE SHOT of Jimmy and San Toy. JIMMY: (Whispering to San Toy) Hey, it's "Flat-foot" Flynn! SAN TOY: (Whispering, looking a bit surprised) Uh-huh. MEDIUM-CLOSE SHOT of Dormers and Flynn. DORMERS: (Surprised) Hey, Flynn you're a bit out of your territory aren't you. MEDIUM SHOT of Chan, Dormers, Flynn, and Sanders. CHAN: So good of you to bring the honorable Dean Sanders. (Points his gun at Sanders) Suspect him to be important member of gang. DORMERS: (Surprised, turning to Chan) Sanders a crook? FULL SHOT of the room as Jimmy and San Toy approach, Jimmy limping. JIMMY: Gee Pop, are you sure? CHAN: Unfortunate friend, Ben Covert, was on trail of international spy ring. Previously, had written me that he suspected important member of ring to be posing as professor at venerable university. His general description made me suspect Dean Sanders. Conversation at lunch today confirm suspicion. Dean Sanders, or should I call you Sir Roderick Sears? Or perhaps, Pierre Montard? SANDERS: Any of those will do...Mr. Chan. CHAN: (As he covers Sanders) You claimed acquaintance with professor Caruthers who exists only in imagination of humble detective. SANDERS: An old trick, but I fell for it. MEDIUM-CLOSE SHOT of Flynn grabbing hold of Sanders' arm, and pulls out his gun. As he does so, his hat falls off. FLYNN: (Retrieving his hat and replacing it on his head slightly askew) Yes, very smart, Chan. Now, I'll take charge of the prisoners myself, Captain Dormers. MEDIUM SHOT of the entire group. DORMERS: What are you talking about, Flynn? Are you kidding or just drunk? CHAN: (Apparently continuing to cover Sanders) "Brother officer" is neither joking nor inebriated. State with greatest confidence that he is last and most important member of spy ring. CLOSE SHOT of Flynn, whose gun points from Sanders to Chan. FLYNN: (Dropping the "clumbsy cop" act) Don't think of using your gun, Mr. Chan. CLOSE SHOT of Jimmy and Irene. JIMMY: (In amazement) Gosh, Pop! "Flat-foot" Flynn a SPY? CHAN: Spy...and murderer...of Ben Covert and unfortunate nurse. Often take most clever man to play the fool. FLYNN: (Straightening his hat, no longer playing the fool) Thank you for the sincere compliment, Mr. Chan. It took a world-renowned detective such as yourself to find me out. CHAN: (Serious) Thank you so much. DORMERS: You can't get away with this, Flynn. There are four of us and Charlie and I will gun you down if you make a move to free these men. FLYNN: (Smiling) I think not, gentlemen. You might notice next to my foot is a button mounted into the floor. CLOSE SHOT of a small, raised cover next to Flynns foot which the foot kicks open, revealing a raised button. Should I step on it, a powerful explosive will be detonated. Now, you wouldn't want to cause the loss of innocent lives would you? CHAN: (Still holding his gun on Flynn) Fear innocent lives are of no great concern to such men as yourselves. SANDERS: As I mentioned at lunch, Mr. Chan, innocent lives are a cheap commodity. FLYNN: Now, Captain, I will ask you to kindly unlock the handcuffs and release my associates. Suddenly the figure of Brandon Mitchell appears from the shadows behind Flynn and rushes headlong into him delivering a crushing cross body block. FULL SHOT of the room as Flynn sprawls foreword. Sally and Irene follow behind. Irene picks up the gun that has been knocked out of Flynn's grasp. Lee has grabbed Sanders and has wrestled him to the floor. CLOSE SHOT of Flynn on the floor. He lunges for a hidden device which he grabs. MEDIUM-CLOSE SHOT of a trap door dropping open in front of Flynn who flees down the opening in the confusion. FULL SHOT of everyone in the room. Chan standing at the trap door entrance. CHAN: (To Sanders) Quickly! Where does passage lead? MEDIUM-CLOSE SHOT of Sanders in the firm grasp of Dormers. BRANDON: No time for lying, now, Sanders. I'd advise you to cooperate. SANDERS: (Resigned) All right, it goes out to the front of the cave near the rock entrance. MEDIUM SHOT as Brandon, Chan, Lee, and Jimmy, following with difficulty, start down the passage. FULL SHOT at the cave entrance as Flynn emerges. He stops briefly looking in the distance. INSERT SHOT of the Fairchild on the beach. FULL SHOT of Flynn in front of the cave entrance as he sprints off in the direction of the beach. MEDIUM SHOT of Flynn as he reaches the plane. MEDIUM SHOT of the cave entrance as Brandon, Lee, Jimmy, and Chan emerge. LEE: (Pointing toward the plane on the beach) Look! It's Flynn! FAR SHOT of the plane on the beach, as Flynn opens the door. BRANDON: (Cupping his hands to his mouth and yelling) Stop, Flynn! You can't get away with it. FLYNN: (Shouting back) Until we meet again, gentleman. MEDIUM SHOT of Brandon, Jimmy, Chan, and Lee. JIMMY: Looks like he's going to get away! CLOSE SHOT of Flynn at the controls of the plane. FULL SHOT of the plane as, with the engine roaring to life, quickly begins to roll rapidly foreword along the hard packed wet sand. MEDIUM SHOT of the group, still near the cave entrance, watching the plane, the noise of its engine clearly heard. BRANDON: Not likely, Jimmy. The controls are locked! FAR SHOT of the plane which is seen rushing down the beach. It takes off and rises steeply, then goes into a tight spiral dive. STOCK FOOTAGE of a plane crashing into the ground and disintegrating into a mass of smoke and flames. MEDIUM-CLOSE SHOT of the group who have all witnessed Flynn's firey demise. CHAN: (Somberly) Most violent end for clever man who played the fool. FADE IN to a FULL SHOT of a hospital room where Jimmy is recovering from his traumatic kidnapping. Chan, Lee, Irene, Brandon, Samantha Wu, and Sally are crowded into the room. JIMMY: Gee, Pop all this attention is embarrassing. I feel all right! CLOSE SHOT of Lee and Jimmy. LEE: You stay put, little brother. You're sitting pretty. MEDIUM-CLOSE SHOT of Chan, Lee, and Jimmy. CHAN: Most fortunate circumstance that dubious secret formula concocted by number two son proved valuable in bringing spy to justice. JIMMY: I guess so, Pop! Turns out it wasn't any good as a power booster. CHAN: Contradiction please! Make powerful difference in lives of Sally and Brandon. Soon to be Mr. and Mrs. Turn out to be "A-number-one" love potion. CLOSE SHOT of Sally and Brandon holding each other, smiling blissfully. SALLY: We'll always be grateful to all of you. CLOSE SHOT of a smiling "SAM" Wu. SAM: And I'M grateful for the "scoop" I'm getting on this story! FULL SHOT of the group as San Toy enters with a tray loaded with glasses and a large pitcher. SAN TOY: (Smiling broadly) Here is something special for all courtesy of my Pop. Mr. Ling Toy's deluxe and extra special chocolate malt. FULL SHOT of the small room as all gather around San Toy. LEE: A toast to my Pop, the greatest detective of them all, Charlie Chan. They all raise there glasses as Chan bows modestly. CHAN: May not be greatest detective, but most assuredly have finest sons. JIMMY: Gee, Pop! I can't add anything to THAT!